It’s nearly time to go back to school and Miffy just can’t wait to see her friends again! This adorable Miffy sleep trainer is the perfect solution for children who wake up too early (or not early enough)! Set the timer so that your little one rises in time to get ready for school and never misses registration. Zzzzzzzzzzz. Yum! Miffy loves having packed lunches and this cute little melamine lunch box is perfect for sandwiches and a snack. It features a cute illustration of Miffy and can be paired with an adorable water bottle, also available from the Miffy Shop. Little ones need a lot of water to keep them hydrated throughout the day; this Miffy drinks bottle is easy-peasy for them to use – just press the button and sip! It also has a clip which you can attach to their school bag to avoid any unwanted spillages. 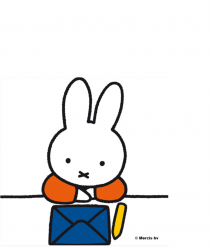 Settle down and read miffy at school to see where Miffy learns to draw, write, read and sing. Her favourite thing is listening to the teacher reading the class a story as she gets to hear about adventures and experiences! Moonpig have created a range of really lovely Miffy cards which you can personalise and choose for any occasion! Why don’t you get your little one a card to say ‘good luck’? These beautiful notepads are available in a number of different illustrations, so you can pick your favourite one! They fit easily into school bags and are ideal for jotting down any notes you may need to make during the day. Don’t forget, on Friday 2nd September you can watch ‘Melanie’s School Trip’ – an episode of Miffy’s Adventures: Big and Small – on Tiny Pop at 11:30pm.